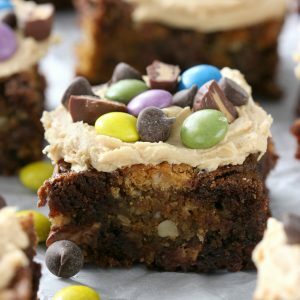 Thick, fudgy, peanut buttery, and filled with chocolates, these Loaded Peanut Butter Monster Cookie Brownies are sure to be a hit at your next party! *Disclaimer: This post is sponsored by SunRidge Farms. All opinions are still my own. How’s your game day menu for this Sunday looking? Are there certain foods that you always serve? Well, don’t forget about dessert in your planning! Most people think about main dishes and dips when they sit down to watch a football game, but dessert is just as important. You can’t have all of that spicy and savory food without something sweet! Thanks to some help from SunRidge Farms, my game day menu isn’t lacking dessert! 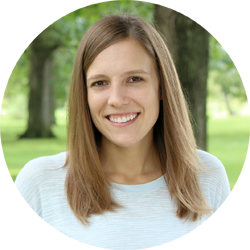 Neither my husband’s team nor my team made it to the big game after both actually had promising starts, but we’ll still be paying attention to both the game and what we’re eating! 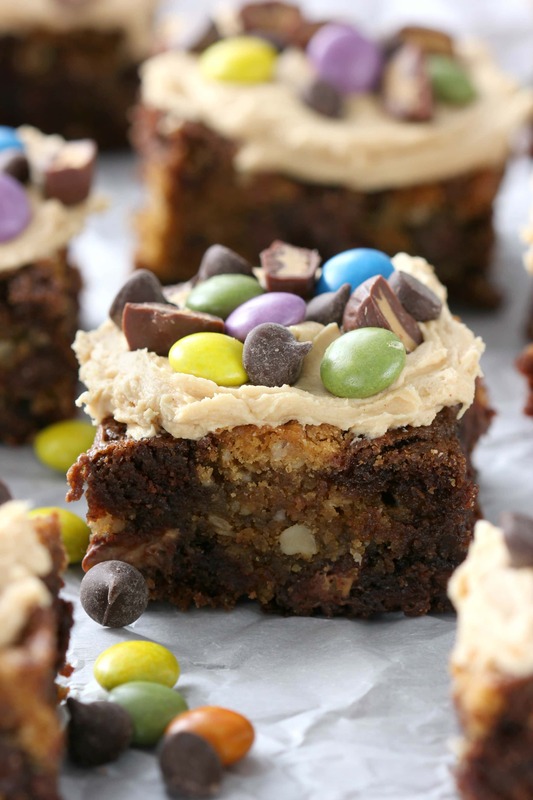 In fact, I’ll be trying really hard to not eat multiple pieces of these loaded peanut butter monster cookie brownies. 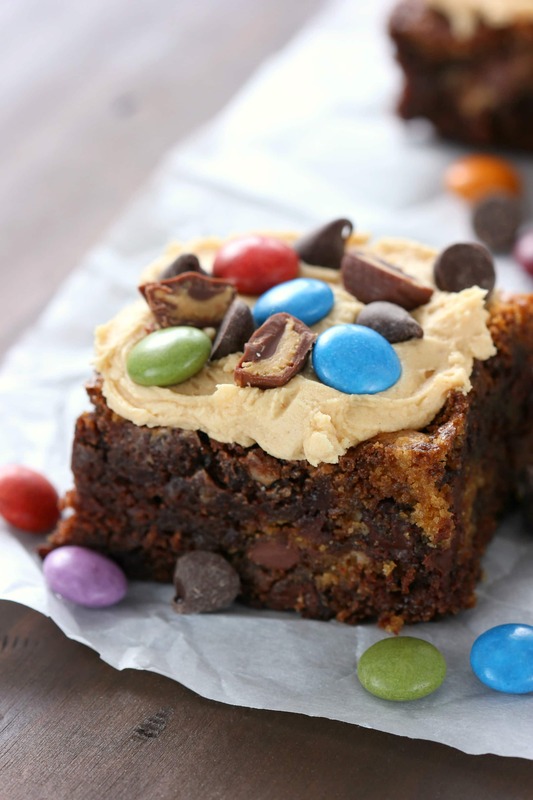 Thick, fudgy, peanut buttery, and loaded with candy, these brownies are sure to be a hit. 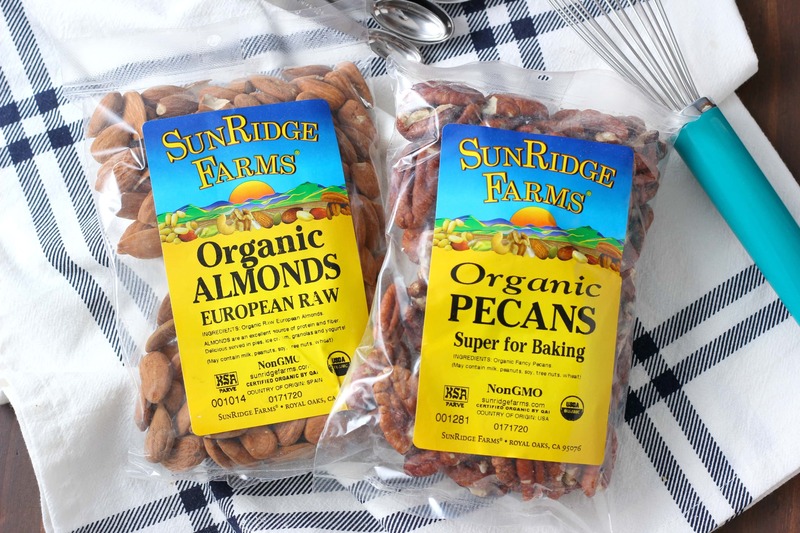 SunRidge Farms is a family owned company that is on a mission to promote healthy living through the quality, integrity and environmental sensibility of its products. I got to try a handful of their products and was impressed with the taste and quality. The Organic Mini Milk Chocolate Peanut Butter Cups were definitely a hit! And I will be getting my hands on more of the Organic Fine GroundWhole Wheat Flour to bake with soon! The texture is perfect for picky eaters! These bulk candies, flours, and nuts were put to good use in these bars. 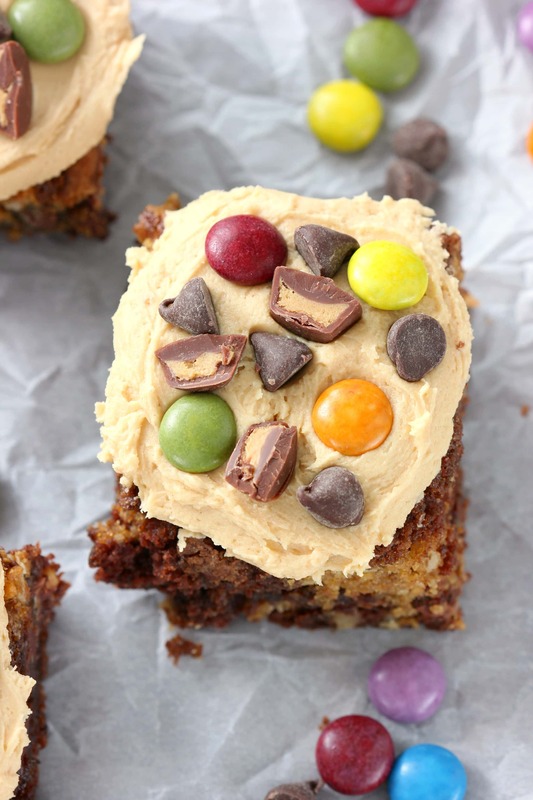 The brownie layer is filled with Organic Dark Chocolate Chips and chopped pecans, and the monster cookie layer is loaded with Fair Trade Milk Chocolate Rainbow Drops, more dark chocolate chips, and mini peanut butter cups! To top everything off we went with a peanut butter buttercream. Peanut butter buttercream makes everything better! As much as we like warm, gooey brownies around here, we found that these tasted better cooled after the flavors got a chance to blend. Though I will never stop someone from eating a gooey brownie! 🙂 These brownies would be a great recipe that you can make a day ahead of time and not have to worry about the day of! Just cut them up the morning of the game, and they’ll be ready to munch on during the halftime show (if you can wait that long!)! 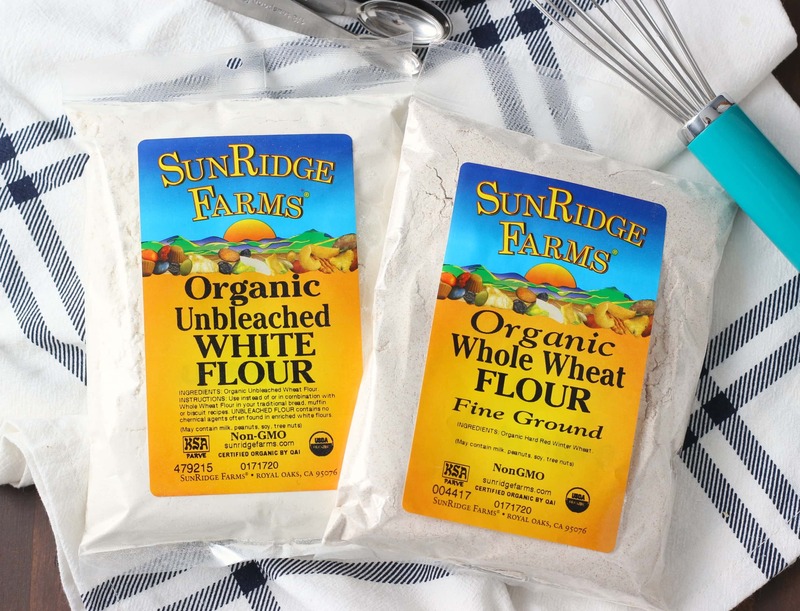 Be sure to look for SunRidge Farms’ products in the bulk aisle of supermarkets such as Whole Foods, Wegmans, Hannaford, HEB, Fred Meyers and Safeway, and independent natural food stores. If you’re local, check out Kowalski’s Markets! Preheat oven to 350. Spray a 9x13 inch baking dish with non-stick cooking spray. Sprinkle with unsweetened baking cocoa. In a medium saucepan, stir together butter, baking cocoa, coconut oil, and water over medium heat. Bring to a boil, stirring constantly to prevent scorching. Remove from heat. Set aside to cool. In a large bowl, whisk together sugar, eggs, milk, and vanilla extract. Slowly whisk in the cooled melted butter mixture. In a medium bowl, whisk together flour, baking soda, and salt. Add the dry ingredients to the wet ingredients and stir to combine. Stir in dark chocolate chips and chopped pecans. Beat together peanut butter and butter until smooth. Add in sugars, egg, and vanilla extract. Beat until creamy. Stir in flour, baking soda, and salt until well-combined. Stir in oats until combined. 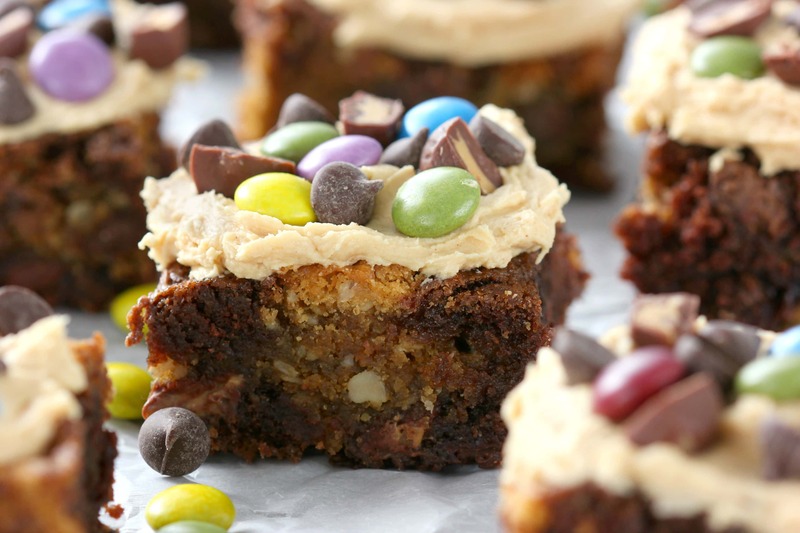 Stir in peanut butter mini cups, chocolate rainbow drops, and dark chocolate chips. Drop cookie dough by spoonfuls over the top of brownie batter. Bake for 30-35 minutes or until toothpick inserted in the center comes out mostly clean. A few crumbs means the brownies will be nice and fudgy. Remove brownies to a wire rack to cool. While brownies are cooling, beat together peanut butter and butter until creamy. Beat in confectioner's sugar, half & half, and vanilla extract. Add additional half & half as needed until desired consistency is reached. Spread frosting over cooled brownies. Top with additional candy. Cut into pieces and serve. Disclaimer: This post is sponsored by SunRidge Farms for recipe development purposes. All opinions are completely my own. Thanks for supporting brands that make A Kitchen Addiction possible! These gynormous cookies have stolen my heart – they are so packed with deliciousness! I’d skip the mains for 1 or 3 of these! 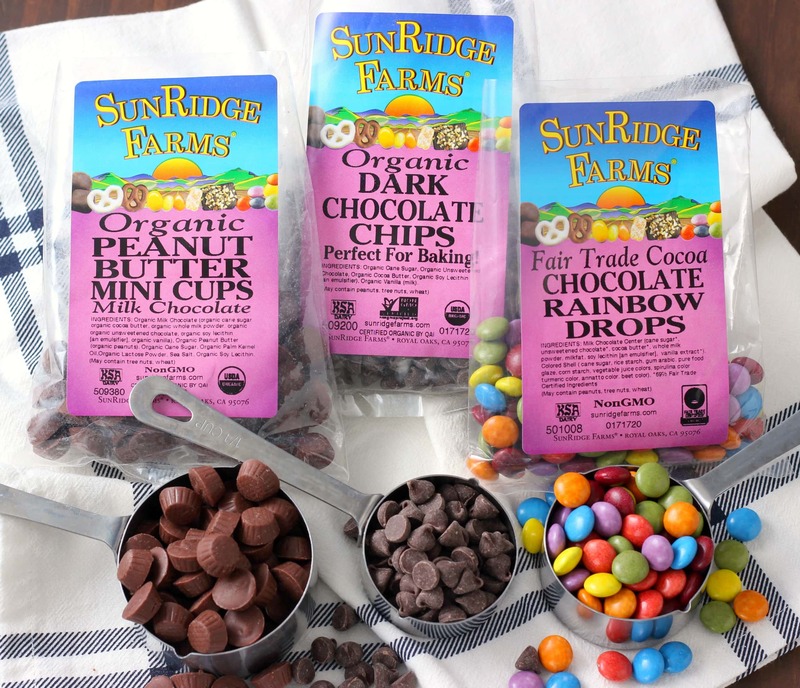 I hadn’t heard of SunRidge Farms – what a variety of stuff they have! This recipe is pretty much my two FAVORITE things mashed together! Love brownies and LOVE monster cookies! Those are seriously loaded brownies! What a treat! Looks wonderful! So festive and fun! Mmm what a great idea! I love the mashup of cookies and brownies. Sounds like the ultimate dessert, especially with that peanut butter! I love how loaded these brownies are! So fun, festive and would be a hit for game day! And here I thought monster cookies couldn’t get any better! Woah! Now that is one loaded cookie bar! I love everything you have stuffed into them! You are not helping my 3pm snack craving right now!! haha These sound so so good!! All the best ingredients! I love it. I’ve never heard of SunRidge Farms, but heading to their site now! Thanks!! These look like something that kids would LOVE!!! Superbowl parties are always awesome but if there are kids in attendance, football is just too long for them! I love the idea of these, because kids can go to town with choosing their own toppings for these – and keep them at least a little bit busy!! Plus – chocolate sand peanut butter are the best combo ever. oooh I love the organic nuts! and these brownies have SO MANY delicious things in one place-love it!